A Bull Head George half crown dating from 1816. The French Revolutionary Wars (1792-1802) and the Napoleonic Wars (1803-1815) led to financial instability in Britain. This was due to direct military and economic warfare against France as well as Britain's financing of a series of coalitions opposed to the French Revolutionary and Napoleonic regimes. In exchange for large cash subsidies from Britain, nations such as Austria, Prussia and Russia, with armies larger than Britain's, were paid to fight against France. The economic conflicts of that era (such as Napoleon's Continental System and Britain's retaliatory measures against it) especially disrupted trade and the availability of markets in Europe for the products of Britain's growing mercantile and colonial empires. A shortage of silver and copper led to a shortage of coins. Paper money became legal in 1797 and local tokens were produced by companies and banks all over the country. Despite an increase in trade, the national debt had increased by 100% by the start of the 19th century. A series of bad harvests pushed up food prices and this culminated in riots in 1801–2. Corn prices halved at the end of the wars, when trade with Europe resumed. The Corn Laws of 1815 were intended to protect the price of domestic grain, but this only served to keep prices high and depressed the domestic market for manufactured goods, because people had to use all their money to buy food. Likewise, European countries which relied on exporting corn to Britain in order to buy British manufactured goods were no longer able to do so. The government needed to find a way to stabilise the currency, and the Great Recoinage was the first step in this process. The main aims were the reintroduction of a silver coinage and a change in the gold coinage from the guinea valued at 21 shillings to the slightly lighter sovereign worth 20 shillings. The value of the shilling remained unchanged at twelve pence. This massive recoinage programme by the Royal Mint created standard gold sovereigns and circulating crowns and half-crowns containing the now famous image of St. George & the Dragon by the Italian engraver Benedetto Pistrucci and eventually copper farthings in 1821. Pistrucci's initial portrait of the King has become known to collectors as the "bull-head George". 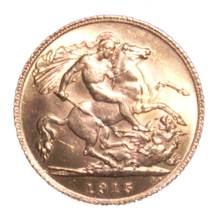 The weight of the new gold sovereigns was calculated on the basis that the value of one troy pound of standard (22 carat) gold was £46 14s 6d. Sovereigns therefore in theory weighed 123.2744783 grains or 7.988030269 grams, although this implies much more precision than it was possible to achieve with the technology of the time. This standard persists to the present day, more than two centuries later. To put a gold standard into effect, and avoid the pitfalls of bimetallism, silver coins were declared legal tender only for sums of money up to £2. The recoinage of silver in England after a long drought produced a burst of coins: the mint struck nearly 40 million shillings between 1816 and 1820, 17 million half-crowns and 1.3 million silver crowns. The value of one troy pound (weighing 5760 grains) of standard (0.925 fine) silver was fixed by coining it into 66 shillings (or its equivalent in other denominations). This established the weight of all silver coins (and their cupro-nickel successors), and their decimal new pence replacements, from 1816 until the 1990s, when new smaller coins were introduced. The silver coins initially produced were shillings weighing 87.2727 grains (or 5.655 grams), half-crowns of 218.1818 grains (14.138 grams) and crowns of 436.3636 grains (28.276 grams). 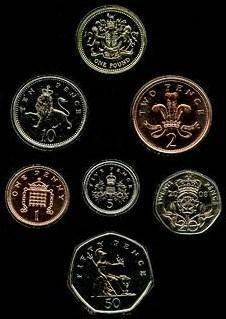 Over the many reigns until decimalisation other denominations came and went, such as the threepence, sixpence, florin, and double florin, always weighing exactly one troy pound per 66 shillings (irrespective of fineness, which was reduced to 50% in 1920, and to 0% in 1947). This made 5 sterling silver shillings (which is 1 crown), about the weight of .9091 troy ounce of sterling silver. ^ Paper against gold, or, the mystery of the Bank of England. William Cobbett. 1846. ^ Report from the Select Committee on the Royal Mint: together with the minutes of evidence, appendix and index, Volume 2 (Great Britain. Committee on Royal Mint, 1849), p. 172. A mohur is a gold coin that was formerly minted by several governments, including British India and some of the princely states which existed alongside it, the Mughal Empire, Kingdom of Nepal, and Afghanistan. It was usually equivalent in value to fifteen silver rupees. It was last minted in British India in 1918, but some princely states continued to issue the coins until their accession to India after 1947. Similar coins were also issued by the British authorities in denominations of 2⁄3 mohur, 1⁄3 mohur and the double mohur, and some of the princely states issued half-mohur coins.